I shall always remember ‘North and South’ as one of the last books that my mother and I discovered together. She loved books all her life, and even when her short term memory and her ability to follow a story faded she still appreciated lovely prose, being told about the books I was reading, and watching costume dramas on television. She loved the BBC adaptation of ‘Cranford’, and was able to recall studying the book and school and talk about how what she watched and heard compared with what she had read decades earlier. When we talked about Mrs Gaskell and her work she said that she had never read ‘North and South’, and I recalled that it had been adapted for television too, and that that adaptation had been much praised and much loved. And so I ordered a book and a DVD so that my mother could watch and I could both watch and read. We were both smitten, but I couldn’t help feeling that I had rushed the book a little, to match the pace of the dramatization. And so I came back to the book, to read it again at a steadier pace. ‘North and South’ has all of the attributes of a great novel. It has a wonderful cast of characters, richly and deeply drawn, utterly believable, and so very engaging. I was very taken with Margaret Hale, who coped so well when she returned from the London home where she had been raised and educated with her cousin Edith, after Edith’s marriage, to live again with her mother and father in his country parish. She was prepared for a life there but she was tipped into a very different life, because her father had a crisis of faith, gave up his parish, and moved his family from the south to the north, where he believed he would be able to support them by working as a tutor. But Margaret could be proud and haughty, she looked down on the mill owners, and she failed to see their side of any argument. In particular she looked down on John Thornton, who worked hard to support his mother and his sister, and who studied with her father; believing him to be arrogant and uncaring. He realised that she looked down on him, but he found much in Margaret to admire …. The story grows quite naturally out of these characters, their lives, their families and their times. There is poverty and there is industrial unrest in the industrial north. And the Hales have a son who is in exile as he is wanted – unjustly – for naval mutiny. His mother’s dearest wish was to see him again before she died …. Mrs Gaskell constructed her plot very cleverly, drawing in all of her character in the north and in the south. It is in a large part driven by familiar devices – a misunderstanding and an inheritance – but they are woven in so well, every thing that happens, every character, every relationship, every interaction, rings completely true. On my second journey through ‘North and South’ what struck me was the wonderful depth of everything: character, plot, time and place. The has things to say about people, families and communities that are timeless; and it speaks equally well about its period, about the consequences of industrialisation; about the social history of a particular time and place. You might say that it was the book with everything: class conflict, politics, religion, family, women’s rights, social responsibility, and maybe love …. I couldn’t doubt for a moment that Mrs Gaskell knew and cared deeply about everything in this particular story. I wondered if she had known a maid as strong and as devoted as Dixon; if she had known a matriarch as proud and as loyal as Mrs Thornton; if she knew a couple who were as different from each other and who loved each other as well and Mr and Mrs Hale. There’s a wealth of detail woven in – details of character, description, dialogue – and that really enriches the story. The moments of drama, the confontations, the dialogues, were particularly well handled. The pace was wonderfully controlled; almost, but not quite stately. I remembered much of the story, of course I remembered the final outcome, and yet the story held both my head and my heart from the first page to the last. And now I know that I love the book both for its own sake and for its associations. < Shall we talk about Seasonal Short Stories? This is one of my all-time favorites. What a lovely review! Thank you. It’s very high on my all time favourites list too. Oh, I loved this so much too! Like you mentioned, I was much taken by how deftly Gaskell interweaves so many disparate elements–social commentary, romance, lush descriptions of english countryside, discussion of nature vs nurture, etc. etc.–into a thoroughly enjoyable story. She does indeed; she catches every aspect of her characters’ lives so well. Let’s not ignore the important politics of the book. 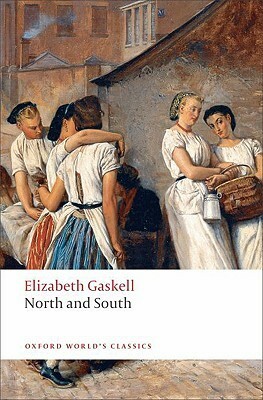 Gaskell as deftly and a lot more subtly than Dickens depicts a complicated strike, she brings in cultural and regional conflicts as well as class. Her depiction of Margaret’s brother’s plight is part of this. Another attribute of a great novel is to make an important statement to its era about such central realities of its time. I very much enjoyed your review: my personal memories have to do with listening to Wives and Daughters read aloud in my car on audiocasettes by Nadia May with my daughter and then watching the Andrew Davies’s film adaptation together. I’ve read with friends on line her superb short stories, _Cousin Phillis_, _My Lady Ludlow_ and _Cranford_. She is a woman’s novelist par excellence too. I can but agree, and I think I’ll need to read this book a third time – and maybe a little more objectively – to take in more of the things to say. I’ve been very taken with Nadia May’s readings of George Eliot, and I can imagine she would read Gaskell well too. Wonderful review Jane! I so loved the book! I completely agree with you on the depth of the characters and considering how well she wrote them, even I have wondered if she had a Dixon or knew a Mrs. Thornton or a mis-matched couple like the Hales….Beautiful wonderful book! Thank you – and thank you for writing about this book so warmly that I had to pick it up again. I have to say that this book grew on me when I re-read it, and I can imagine reading it a third time and thinking more on other aspects of the story. I love this novel, you captured how rich it is. I also enjoyed the adaptation, although the novel is definitely superior! Yes, the novel is better and I appreciated many details that I’m sure I would have missed had I only watched. I thought that Wives and Daughters was my favourite, but now I’m torn. That might be the book I’d prefer to live in, but I think it would be fair to say this is her finest fork. Even though I have yet to read May Barton …. I am a fan of Wives and Daughters, too, and given the choice I’d move to Cranford 🙂 Mary Barton is all the misery of a Thomas Hardy novel with added northern chill, I’m never picking it up again! Fabulous review, Jane. Sometimes we have such personal connections with books, don’t we? This is not a Gaskell I’ve read, though I do own a copy, and I feel I should go back to her work. Such a marvellous writer. This is a lovely review of what is truly a wonderful book. I definitely agree that the wealth of detail and the attention Gaskell pays to character development is excellent. It is – she caught all of her characters’ worlds so well. Lovely review, especially with the memories you associate the book with! I really need to try and get some classics read (and reviewed!) – I’ve rather dodged them since my A-level English Lit (I think it was all the Chaucer that put me off!) That can be a New Year’s Resolution! I would imagine that studying Chaucer could put anyone off, though of course the right teacher can make all the difference. This is a classic, but it is a very good book that simply has that label because it was written some time ago and has endured. Lovely review. How nice that your mother could still enjoy literature, in spite of the short term memory loss. I’ve not read this yet but watched the adaptation not too long ago and liked it very much. I’m sure I’d like the book as well. I think you would, and I hope you will read the book. Good though the adaptation was there are many details you would have missed, and some of the characterisation was a little simplified. It is so wonderful to read about your special connection to the book. I had already planned to read North and South next year, but I will make it a priority now after reading your review. It shall be the first book for my Back to the Classics challenge. That’s wonderful – I’ll look forward to reading your thoughts. I love that books can bring people together, and that a love of stories and lovely prose really can last a lifetime. I loved this too – many years ago now, you make me long to re-read it, super review. Well, I’m glad that I re-read it and I can easily imagine reading it for a third time one day. Great post, the connection between you an your mother through a beloved book is wonderful. I read this a while ago so it is not fresh in my mind but I remember how well Gaskell wrote about the cotton spores pervading the factory atmosphere and affecting the health of the workers. She introduced me to many children’s classics, so it was lovely to share a classic with her much later in life. Mrs Gaskell did write very well about the cotton mills, and many other things, in this book. What a lovely post; I respect the layers you’ve brought to your newest reading of the book. I haven’t read it for ages, yet I remember loving it and I think it will have to come out some time next year.